I have found very few kids over the years who do NOT like ‘Rice Krispie Treats’. We eat them regularly at home, take them to parties and share with friends at school. I was bored with the same old recipe so made a few alterations which have become a HUGE hit in our home. The best part about this treat is that so many peanut-free, tree nut-free and gluten-free people already LOVE them. With a few simple changes, it is easily made dairy-free too. I’ll be surprised if this doesn’t become a household favorite for you, too! 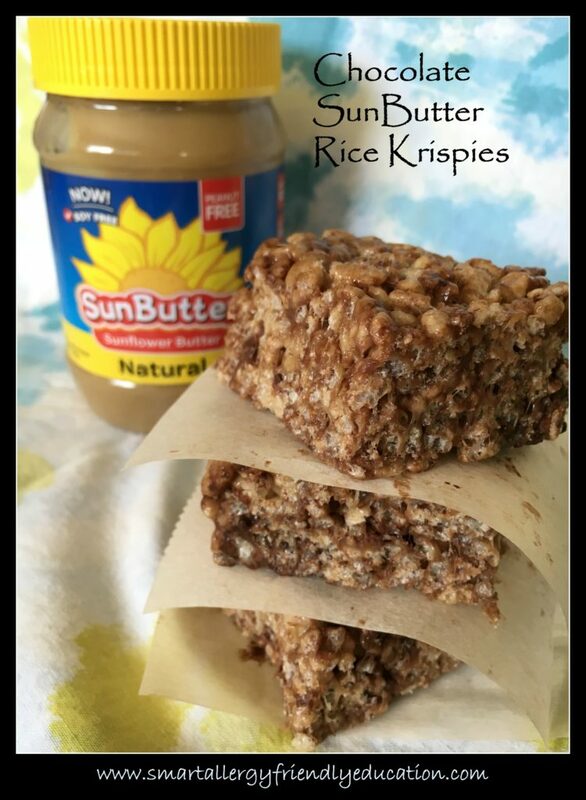 1/2 C SunButter – ANY type will work! 1. In a large saucepan, melt dairy-free margarine (works just the same as regular butter or margarine) over low heat. 2. Add allergy~friendly marshmallows and stir until completely melted. Remove from the heat. 3. Stir in SunButter until well mixed. For this recipe, I prefer the Natural SunButter. Coating your measuring cup with a spray oil will stop the SunButter from sticking so much. 4. Add your preferred Rice Krispie cereal. Stir until well mixed. Using a margarine covered wooden spoon or spatula will make it easier. 5. Mix in chocolate chips. They will melt in, making a swirling look. 6. Coat 13 x 9 x 2 inch pan with cooking spray, shortening or coconut oil. Evenly press the mixture into the pan. Again, using a margarine covered spatula works great. Enjoy and Eat Immediately! Or Freeze! After cutting into squares, place in layers separated by wax paper in an airtight container. Freeze for up to 6 weeks. Daniella Knell, is the owner of Smart Allergy~Friendly Education. As a mom of 2 having 6 of the top 8 food allergens, she has been public speaking for 10 years in efforts to raise allergy awareness within her Boise community and nationally. Follow her at: Facebook, Linked In or Twitter.